The earliest burials there date back to California territory, though their interment there came later, after the remains were moved there in 1882. There’s a monument there commemorating the 62 sailors who died aboard the USS Bennington when an explosion in the boiler room of the ship, then anchored in San Diego Harbor, ripped through the vessel on 21 July 1905. There are memorials to the men of the USS Wasp, lost during Battle of Guadalcanal on Sept. 15, 1942, and to the men of the USS Gambier Bay, USS Hoel, USS Johnston, USS Samuel B. Roberts, and USS St. Lo, lost during the 1944 Battle of Leyte Gulf. 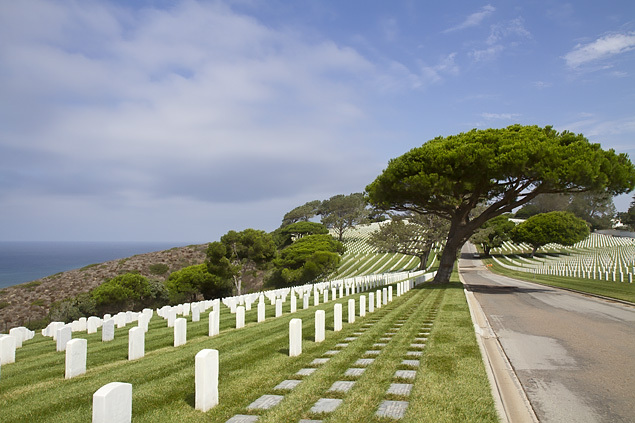 There are somewhere in the neighborhood of 101,000 people buried or memorialized in the 77.5-acre park-like setting of Fort Rosencrans National Cemetery,2 which lies on the long narrow spit of land called Point Loma, in San Diego County, California, with San Diego Bay on one side and the Pacific Ocean on the other. And there is one, and only one, marker in that entire national cemetery that speaks to The Legal Genealogist‘s heart. Where, thanks to Cindy Ehrlich of the San Diego Genealogical Society, yesterday, I laid eyes on that marker for the very first time. 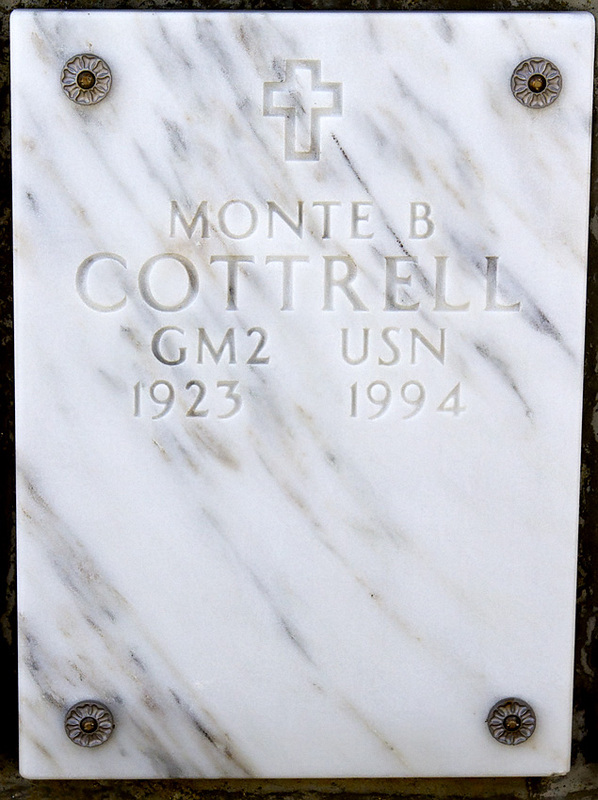 Monte B. Cottrell was the fourth-born, and third surviving, child of my grandparents, the brother just older than my mother and to whom she was so very close. Born 23 November 1923, he died 6 August 1994, in San Diego County,3 where he had lived much of his adult life. 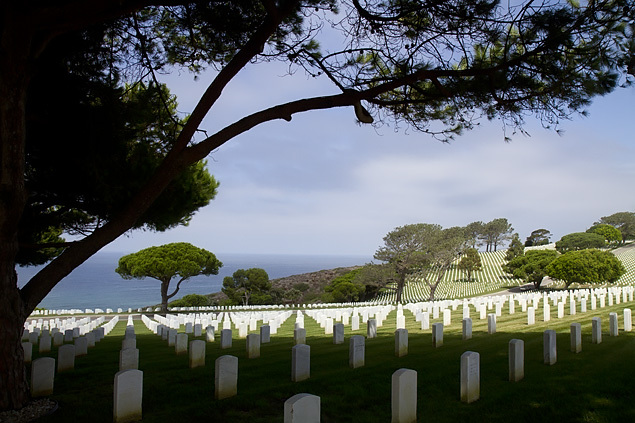 A World War II veteran of the Navy Armed Guard,4 his remains rest in that peaceful cemetery high on the narrow spit of land between the bay and the ocean. His marker is on one of the memorial walls, overlooking the white markers flowing down the hillside towards the Pacific. It is a glorious view and a fitting resting place for this gentle member of my family. I’m so glad to have had the chance to see this lovely place with my own eyes. 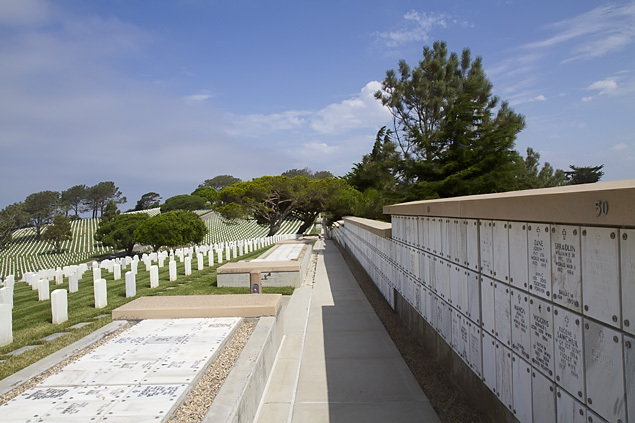 Images: Fort Rosencrans National Cemetery, 32°41’12″N 117°14’41″W, Cabrillo Memorial Drive, San Diego, CA; photographed 8 Sep 2017, by the author. I’m touched by the fact that you got to see your Uncle Monte yesterday. I want you to know that I will say hello to him each time I visit my father, Sgt William E Crowley US Army Air Corps, b 1921 – MIA 1944, who is commemorated with a marker I had placed at Fort Rosecrans. Ironically, he faces the Pacific of his burial near Yap Island). Thanks so much, Sharon… for the kind words, and the offer to say hello at Fort Rosencrans.